Britain's top javelin thrower Goldie Sayers says she expects to face Olympic standard competition at the European Team Championship in Stockholm. The event, which starts 18 June, is a key date for the 28-year-old as she steps up her recovery from injury. "It's a real test, it could be an Olympic final really," she told BBC Radio Cambridgeshire. "All my main rivals will be there and getting a medal placing would be great having had the setback." 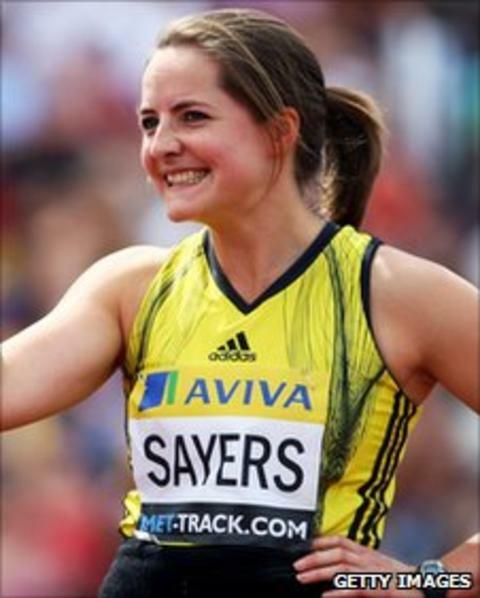 After overcoming a hip injury picked up at last year's UK Championships Sayers hit another setback in April, undergoing surgery after damaging her knee while training in Los Angeles. The Cambridge athlete marked her return with a throw of 61.61m at the Inter Counties Championships at the end of May. "I've had no real problems with my knee at all, I've got no real concerns with the injury, it's more a case of finding my timing coming off the speed a full run up gives you," explained Sayers, who finished fourth at the Beijing Olympics three years ago. "You can shorten your run up but it doesn't resemble the speed you come in off a full run up which obviously gives you the increased distance. "It's going to take me a few weeks to find that but that's what competing does." The aim is to be firing on all cylinders when the World Championships in Deagu, South Korea come around in 11 weeks time. "The measure of your season is all about the main championships which is the World Championships," added Sayers. "This year's all geared up to Deagu, having missed a few weeks of high intensity work I hope to do as many competitions as I can in the build up."